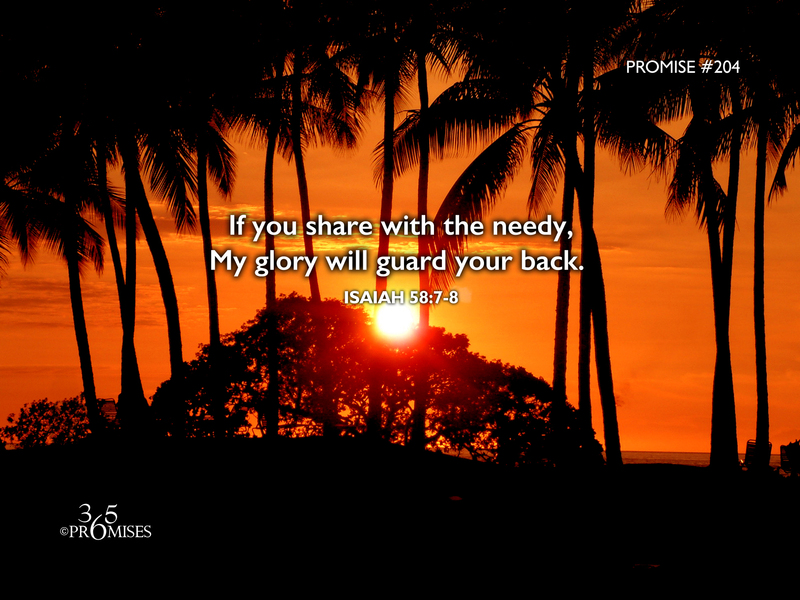 If you share with the needy, My glory will guard your back. 7 Isn’t it to distribute your bread to the hungry, and that you bring the poor who are cast out to your house? When you see the naked, that you cover him; and that you not hide yourself from your own flesh? 8 Then your light shall break forth as the morning, and your healing shall spring forth speedily; and your righteousness shall go before you; the glory of Yahweh shall be your rear guard. God's heart is always for the poor and those who are in need. It is simply a foundational part of the heart of God. He protects the widows and the orphans. He says that the poor of this world are called to inherit the riches of His everlasting kingdom. In this promise, God says that if we look after the needs of the poor and our own family, there are many benefits that will come our way. Our light will break forth like the dawn, healing will quickly appear, righteousness will go before us, and the glory of the Lord will be our rear guard. God's heart is always for the underdog. He is always thinking of those who are need. When we really connect to the heart of our God and Father, we will share His concern for those around us. The stronger His heart beat becomes in us, the more we will share what we have with others and the more His glory will guard our back. May each one of us become more aware of the immediate needs of those around us today.